My eight-year-old daughter is a tomboy. She only wears clothes bought in the boy's section. Her lone Barbie is somewhere in the basement, probably in pieces. She runs with her whole body. When she tends goal in soccer, she dives for every shot. Grass stains are a constant companion. When my mom died three years ago, I brought some of her jewelry home with me, including a pinky ring she owned. I was about thirteen when she got it. She bought one ring for me, one for my sister, and one for herself. Each had its own color stone. Mine was blue. My mom's was green because that was her favorite color. Now that my daughter's fingers are big enough, I've given her my mom's pinky ring. 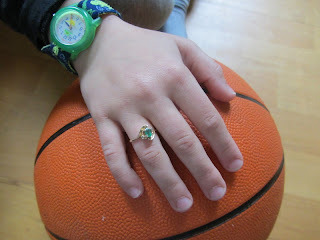 Despite a wardrobe of black and dark blue, despite having a "boy's" haircut, despite being thrilled every time someone mistakes her for a boy, my daughter loves to wear the ring. An ocean separated us from my mom, and we did our best to encourage a relationship via phone calls and Skype and vacations. But my daughter was only five when my mom died. Really, I'm sure she has only murky memories of her grandma at best. I asked her why she likes to wear the ring, and she said it was because it was grandma's. It touches me that she values that connection. And it makes me wonder if she wants it for herself or just because she knows it's important to me. I guess the reason doesn't matter. Either way, she's a pretty amazing kid.